Yes, it’s Mother’s Day. 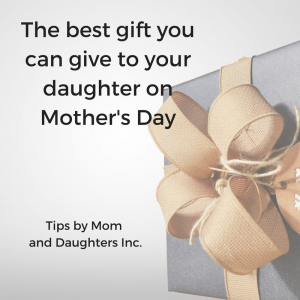 But after you take a few hours of well deserved rest, I encourage you to consider the most amazing gift you can give your daughter. It will allow her to keep the gift giving lonnnnnng after she leaves home for adulthood. I read a recent article about the pay gap that women experience in this country. It sums up the number of years that women will have to work in order to reach pay equity with men. And yes, women of color have a glass of something first. You will need to calm your nerves when you see the differences. My daughter is still pint sized. But I sent her in the corner store recently with cash. I wanted her to buy cookies by herself. First, we talked about the correct change. We also discussed the conversation that she might have with the cashier to ensure that she received the correct change. It’s soooo easy in our cashless environment to do everything ourselves. So involve your daughter in decisions where possible. I purposefully stood back and let my daughter handle the entire cookie buying exchange. This is a key with today’s youth. We want to empower them. But it’s sooooo easy to want to step in and do all of the decision making. Nope, let them learn about financial decisions through experiences. Even when you see them crashing and burning. Even when you want to save them. Otherwise, they won’t feel the sting of the lesson. Be clear. I am not suggesting that you give them the PIN codes to the family bank account. But where possible, give them the opportunity to make family financial decisions. Perhaps you give them a set amount that you’ll pay for extracurriculars. Let them do the research and sign up for the classes. Why not give them money to buy back to school clothes? And allow them to deal with the rough choice of having only a few pair of stylish clothes to last the entire year. Or if they have to sell something for a school fundraiser – walk with them to friends and family and make them deliver the sales speech? Don’t do it for them. As much as it would be easier. I can remember the first time I negotiated with a client. I was nervvvvvvouuus. Because I had always been told to be grateful for whatever was offered when I first got started in business. Until I realized that many other businesses were earning WAY more than I was. Luckily for me, I had visited countries like Egypt and Morocco when I was younger. Countries where negotiating is a way of life. It was almost insulting if I didn’t go through the negotiation process with the seller. So I had a teensy bit of practice. It’s a conversation that affects many women when they start their first jobs. They often are willing to accept whatever salary is offered. And that has a lifetime impact on their career earnings. So don’t jump into these ideas all at once. But consider tackling them on a regular basis. 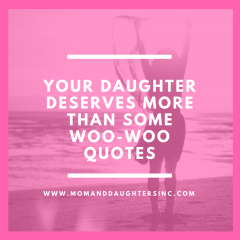 Your daughter – and her future financial earnings – will thank you for this investment of time. Because you want her college application to look better. I’m betting that she has enough activities on her resume right now. 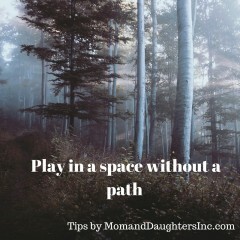 Instead, give your daughter time to explore her interests and make some mistakes. 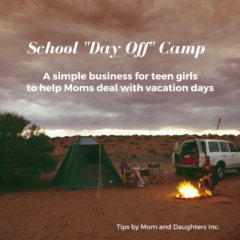 The next Mom and Daughters Inc workshop is coming – 6/12/13 NYC !! !